Banksy’s "Umbrella Girl" was among the most beautiful and poignant of his compositions. The image features a forlorn young girl who, naturally, relied on her umbrella for protection, but discovered that the umbrella itself was the source of the rain. New Orleanians who presumed levee protection were immediately able to relate to the "Umbrella Girl’s" existential situation. Banksy, whose works have sold at auction for as much as £660,000, created the mural after Hurricane Katrina in 2005. It is among a dozen made in 2008 in the US state of New Orleans by the mysterious artists, many of which have been painted over or destroyed. New Orleans photographer Charlie Varley was one of many people who visited the work site at Rampart and Kerlerec streets as unidentified workmen labored to remove "umbrella girl" from the wall of a building on Feb. 21. Varley captured of one of the men as he used a power drill to remove the portion of the wall that bore the valuable artwork. 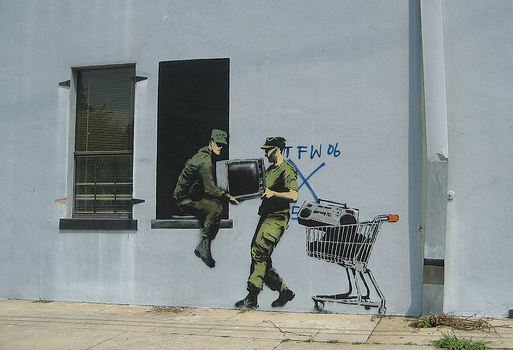 WWL television reported that neighbors stepped in to stop alleged thieves from stealing the Banksy. Indeed, a New Orleans police report bears that out, saying an attempted theft was reported at 8:54 p.m., having occurred about 1 p.m., said officer Garry Flot, a Police Department spokesman. The owner estimated the piece's value at "several thousands of dollars." Police were seeking two men, each 25 to 35 years old with light complexions. One was said to be about 6 feet tall with short hair. The other was about 5 feet, 9 inches tall and unshaven and wore a The Home Depot apron. They drove away in a white Budget rental truck on Kerlerec. The following Saturday, a temporary plywood wall was erected around the painting and a guard was posted for its protection.